If you're looking for some great pre-teen water slides in Tacoma and the surrounding areas for the little ones, we have the perfect fit for you. Our Kids Castle Combo Water Slide provided the best of both worlds by combining bounce house and an inflatable slide. With it's beautiful design and style, your little king or queen will rule over their very own castle. 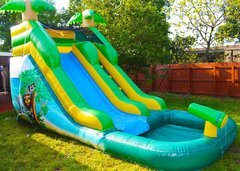 When it comes time to take your next backyard party or big event to the next level with the little ones, you just can't top our any of our Water Slide options. Having trouble deciding what to rent because there are just so many choices. Give our knowledgeable and friendly staff a call at (253) 353-9797, they will be happy to provide you with information specifically tailored to your party requirements. 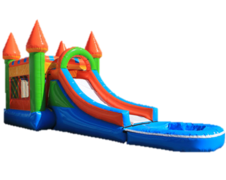 Whether you need a fun inflatable obstacle course or games to keep the kids and parents entertained, we have what you need and with our large inventory we are sure to have even more than you can imagine.